The all-new, gasoline-free Ford Focus Electric is the company’s first-ever all-electric passenger car – a zero-CO2-emissions version of Ford’s popular small car expected to be the first of its kind to achieve the equivalent of a 100 miles per gallon fuel efficiency rating with seating for five. Two of its main rivals in the US, the Nissan LEAF and Chevrolet Volt, come close, achieving 99MPGe and 93MPGe, respectively. Focus Electric is the flagship of Ford’s transformed lineup, one-third of which will feature a model with 40 mpg or more in 2012, building on the company’s commitment to give fuel-efficiency-minded customers the Power of Choice. Focus Electric also is the first all-electric vehicle to feature faster charging technology, allowing it to fully recharge in three to four hours – half the time of Nissan Leaf. This technology can help double the car’s range during a busy day of driving and recharging multiple times. With 20 years of Ford research and innovation behind electrified vehicle software and hardware technology, the company offers proven engineering and design with Focus Electric. Ford holds approximately 500 patents, with several hundred patent-pending applications on technologies used in the new Focus Electric and its other electrified vehicles. Ford began taking orders for the 2012 Focus Electric in November through Certified Electric Vehicle Dealers in California and New York/New Jersey markets. In 2012, availability of the Focus Electric will expand to another 15 launch markets as production ramps up. Focus Electric reflects Ford’s commitment to deliver fuel-efficient vehicles without sacrificing performance, capability or driving fun. Though range and miles per gallon equivalent figures are yet to be finalized, Focus Electric is expected to be competitive with other comparable all-electric vehicles. Focus Electric will be powered by an advanced lithium-ion (li-ion) battery system with an advanced active liquid cooling and heating system to precondition and regulate the temperature in its larger, more complex battery system. The durability and longevity of batteries – which Ford has been developing and testing since the 1980s – is essential as the company expands its electrification plan. To date, among the nearly 43 million battery cells Ford has tested or seen put to work in customer vehicles, only five issues have been documented. Even with relatively stable gas prices, fuel economy is the top purchase consideration for new vehicles. Nearly 45 percent of customers say fuel economy is their top consideration based on a Ford survey of Americans in 36 cities this fall. Styling was the next consideration, with only 16 percent of study participants saying it was their top purchase driver. 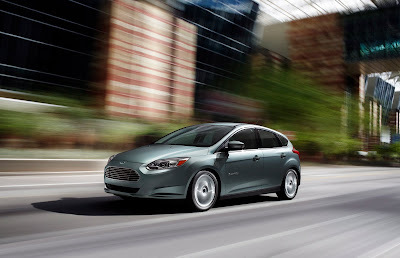 The fuel efficiency of Focus Electric sets it apart from other vehicles. For example, the cost to travel 80 miles is $2.10 – based on the amount of energy it takes (measured in kilowatt-hours) and the national average cost of a kilowatt-hour. Driving 80 miles in a competitive gasoline-powered vehicle that gets 30 mpg would cost $8.80, based on a per gallon cost of $3.30. A unique “set it and forget it” value charging feature, powered by Microsoft, is designed to help owners in the U.S. charge their cars when the utility rates are lower. The tool aims to help customers avoid unnecessary expense by providing an optimized charging solution. In the future, these smart charging habits can help utility companies understand and better manage the demands placed upon the electric grid because of electrified vehicles. Focus Electric is the first all-electric vehicle to offer faster charging technology, allowing a full recharge in three to four hours with the 240-volt charge station – half the time of the Nissan Leaf. Ford and SunPower Corp. have teamed up to offer customers a rooftop solar system that can provide enough clean, renewable energy to offset the electricity used to charge the car. The car’s charge port – conveniently located on the left front fender – activates a light ring that illuminates the port twice when plugged in. The light ring then illuminates in quadrants as the car charges. Each quadrant represents 25 percent of the maximum battery charge. Flashing quadrants represent charge in progress and solid-lit quadrants show stages of charge completion. When the entire ring is solidly lit, the car is fully charged. Focus Electric’s SYNC® with MyFord Touch® driver connect technology was specifically developed for electric vehicle owners and displays key information such as battery state of charge. The system’s MyView feature allows drivers to access even more vehicle data including the electrical demands of such accessories as air conditioning, which can impact driving range. Drivers also can input destinations, including their next charge point, into the car’s MyFord Touch map-based navigation system, and the car will coach drivers on how to achieve the desired range – or advise if travel plans need to be adjusted. The on-board navigation system provides an EcoRoute option based on characteristics of efficient electric vehicle driving. The Focus Electric’s next-generation SmartGauge® with EcoGuide fuel economy coaching system features a cluster display that uses blue butterflies to represent the surplus range beyond the driver’s charge point destination. The more butterflies there are, the more surplus you have to get to your final destination. At the end of each trip, a display screen provides distance driven, miles gained through regenerative braking, energy consumed and a comparative gasoline savings achieved by driving electric. The feature also allows the owner to program the car to use electricity from the grid to heat or cool the cabin while plugged in – called preconditioning. For example, during hot summer months, owners can preprogram the car the evening before to be fully charged – and fully cooled to a particular temperature – by a certain time the following morning. Working with MapQuest®, MyFord Mobile can communicate charge station information and other points of interest to Focus Electric using SYNC Services. Turn-by-turn guidance is provided by the in-car map-based Navigation System. Drivers can also get up-to-date charge station information directly to their car simply by connecting to SYNC Services. Not only is Focus Electric designed to provide outstanding energy efficiency and reliable operation, it also delivers real driving enjoyment. The all-electric powertrain and single-speed transmission provide immediate responsiveness and smooth acceleration when the driver pushes down the accelerator; it’s expected to achieve a top speed of 84 mph (136 kph). Much of the Focus Electric’s steering, handling and braking feel is shared with the agile, sporty, fuel-powered five-door hatchback Focus model upon which it’s based. At the same time, the vehicle’s absence of gasoline or diesel engine and its outstanding aerodynamics lead to a remarkably quiet, comfortable in-car experience. Other standard features on Ford Focus Electric for North American customers include 15-spoke 17-inch aluminum wheels, a 60/40 split rear bench seat, push-button start, AM/FM/CD/MP3 Sony® Audio with nine speakers, SiriusXM Satellite Radio and HD Radio™. Also included is a free, three-year subscription to SYNC Services, which provides access to information about traffic, news, sports, weather, horoscopes, stock quotes and movie listings, along with business searches and turn-by-turn directions. All Focus gasoline and electric variants to be sold in North America will be built at Ford’s Michigan Assembly Plant in Wayne, Mich., with production powered in part by one of the largest solar energy generator systems in the state.